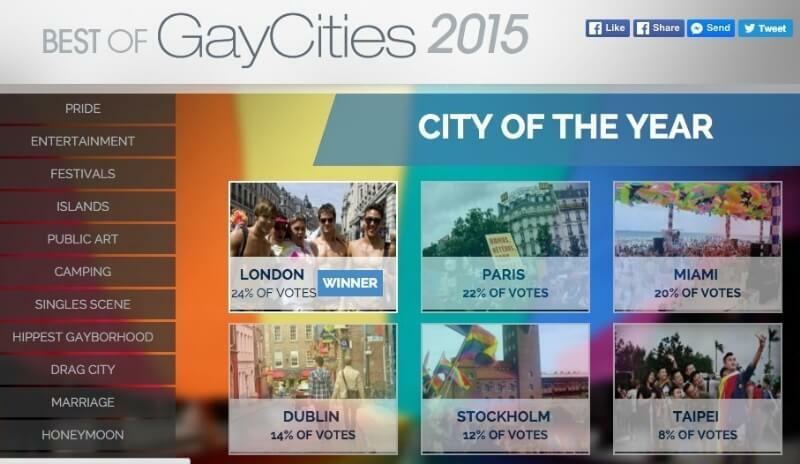 London received the most votes by GayCities readers in the “City of the Year” category, edging Paris by twenty votes. American LGBTQ meccas New York City and San Francisco were awarded for “Singles Scene” and “Showstopping Entertainment,” respectively. Providence, Rhode Island, earned the “Up-and-Coming City” title, putting it on the national radar. Nearly 20,000 votes were cast for great destinations in 13 categories. The nominees were selected by GayCities editors based on reviews, hearts and check-ins this year by GayCities members across the globe. Each winning city will receive a special virtual badge on the home page of its GayCities guide. Q.Digital is the trusted voice in the LGBTQ community reaching more than 7.5 million visitors per month (per Google analytics). Q.Digital connects brands to the LGBTQ community through its various properties—Queerty, the news and entertainment site; GayCities, the travel site covering 224 cities worldwide; and LGBTQ Nation, America’s most followed LBGTQ news source. Q.Digital is an indispensable resource for individuals seeking inspiration for their life’s experiences. Q.Digital enables major brands such as HBO, Lexus, and Stoli to connect with this audience on a personal and credible level through custom branded content, video, live events and promotions.